When we went home last year we went to a nice dim sum place at Jalan Imbi and they served braised peanuts as snack as normally the Chinese restaurant will serve you salted peanuts or 'Keropok' . I really like their braised peanuts because is soft, sweet and salty. I got this recipe from 'Kuali' but I have to omit some of the ingredients since I don't have it. This dish is really good as snack or eats it with hot rice porridge. 1) Rinse soak peanuts and drain well. 2) Combined all the above ingredients in a pot with some water and bring to boil. 3) Reduce the heat and continue to simmer until peanuts are soft. It might take 1 1/2 - 2 hours. 4) Serve peanuts warm or at room temperature. Note : The peanuts will cook faster and softer if you use pressure-cooker for 30 min. 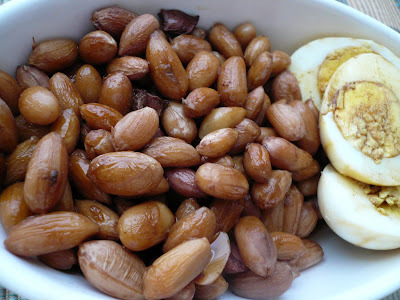 I added some hard boil egg to the braised peanuts. There is a local market here in Richmond that selling boiled peanuts... They have the best boiled peanuts in town... I think I'm going to get some this weekend... I love boiled peanuts..
Gert, your braised peanuts looks good too... Did you cook the peanuts with pressure cooker? Oh I love these peanut dish, lovely, can get them in a jar made in taiwan! lol! The eggs u added remind me of this dish, braised eggs with pork. I love that gravy especially with lots of star anise. Cat, me too prefer boil peanuts than the roasted kind. No, I didn't have a pressure cooker so I have to cook it for 1 1/2 hours. BBO, I heard they do sell this in a jar or can. Where can I buy it ? hi, i have a question. i would like to try this recipe and was wondering if you peeled the peanuts before or after you boiled them? Carrie, I didn't peel the peanuts. I just boiled it as it is. I have been following your blog and loved all the dishes you post on here. 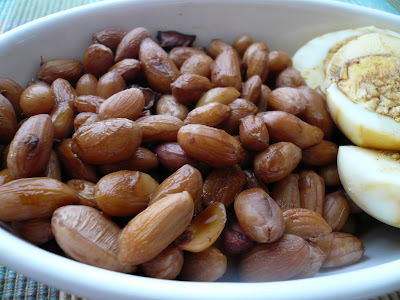 I cooked this braised peanuts over the weekend and put it up on my blog, i hope you don't mind. Thanks for recipe! The recipe from Kuali have 2 g liquorice stick (kam chou) and 3g chuen koong (not sure what is it) in it. I just omit these ingredients and didn't replace it with anything else.